I once visited a very good friend of mine and she made whole baked tomatoes, filled with rice, herbs and cheese, as part of the meal. The tomatoes looked really pretty, but there is something about me, and baked tomatoes. I can’t eat them, once they are baked. My friend had been planning this meal for so long, I didn’t want to disappoint her by refusing to eat the tomatoes. I ate them, slowly, and tried to look like I was enjoying the meal, but baked tomatoes? Not for me. Do you bake tomatoes?. I love fresh and sun-dried tomatoes or fully cooked tomatoes in a sauce. This recipe is very simple but it tastes fabulous. I make it once a week. Please note that I shall be taking some time off the blog to attend to some pressing issues. I shall continue posting automatically via the dashboard but will only respond to your messages from 15 May 2014. Meanwhile, I want to thank you in advance, for liking my post(s) or leaving a message. I wish you a happy blogging and the best of times! Whisk the olive oil, vinegar and honey together, then season to taste. Add parsley, basil, onions and garlic and stir to combine. 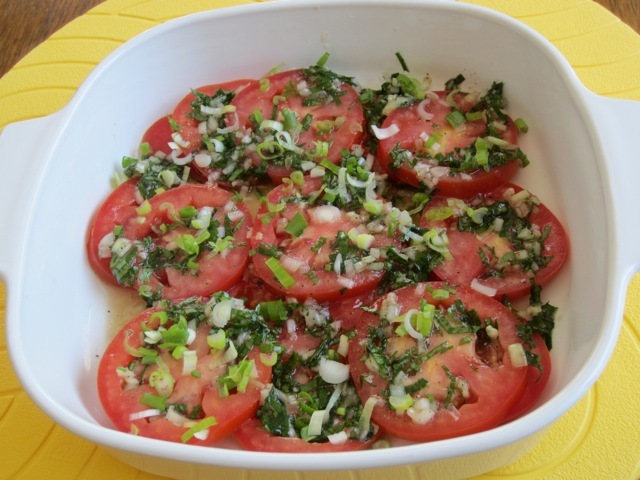 Arrange sliced tomatoes in a single layer on a plate. Sprinkle some green onions on top. Drizzle dressing over the layer. 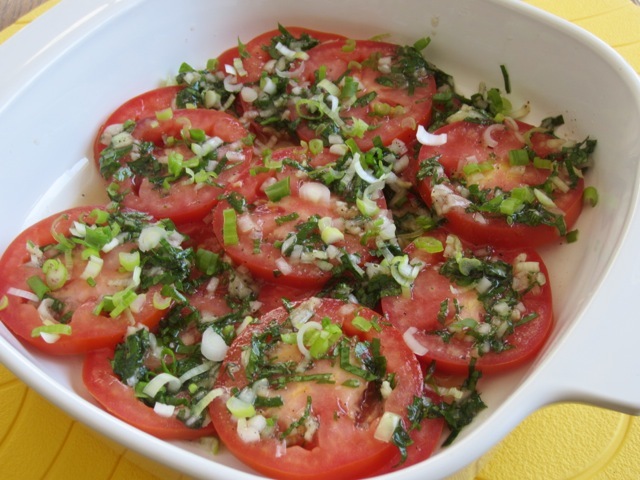 Add another layer of tomatoes, sprinkle green onions and drizzle dressing over the layer of tomatoes. Continue layering until tomatoes are finished. 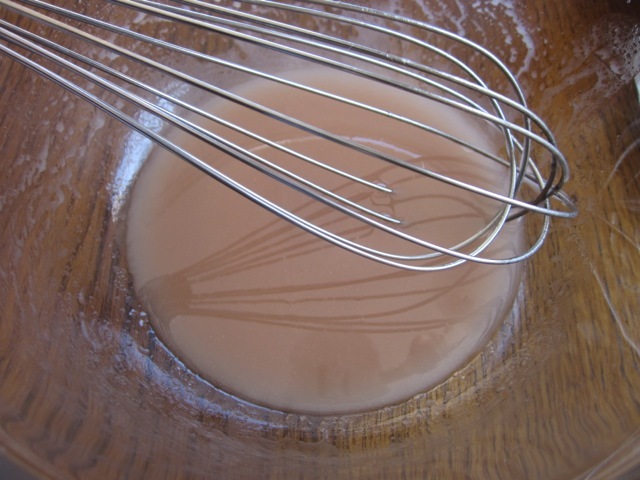 Whisk the olive oil, vinegar and honey together, then season to taste. Add the parsley, basil, onions and garlic and stir to combine. 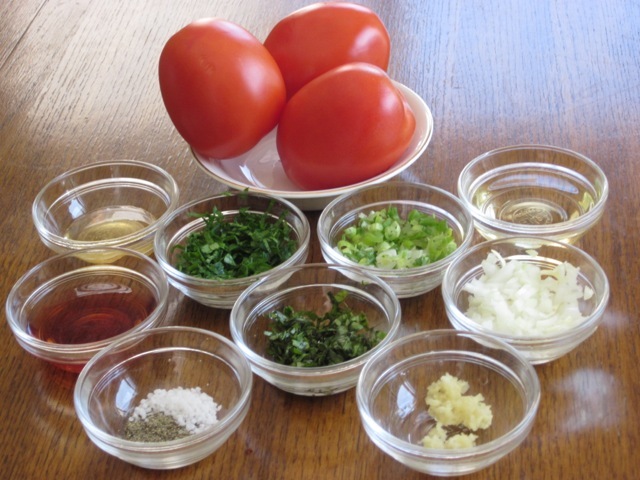 Arrange sliced tomatoes in a single layer on a plate. Sprinkle some green onions on top. Drizzle dressing over the layer. 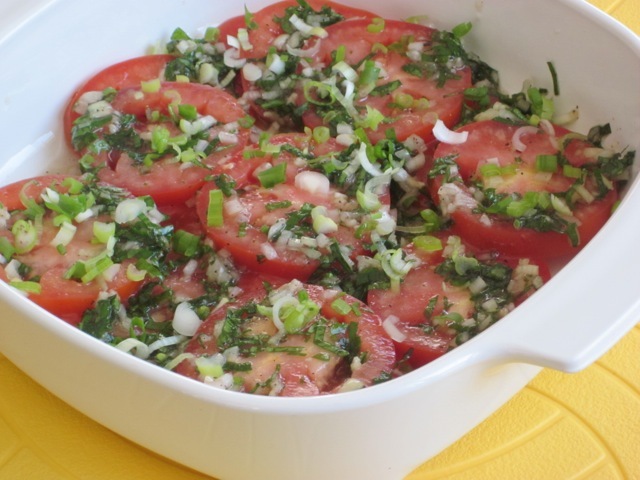 Add another layer of tomatoes, sprinkle green onions and drizzle dressing over the layer of tomatoes. Continue layering until tomatoes are finished. Serve. Thank you, John Frank. Have a lovely week! I’m back but feeling a bit lazy so doing things slowly. I hope I shall be in the right mood soon. Enjoy Sunday! So good to visit your blog again! Things have been crazy over here. Anyway, this is looking so fresh and makes me want to go and eat a whole vine of tomatoes. Can’t wait until the summer crop ripens up 🙂 Hope you’ve been well! All is well here and hope for you too! Have a pleasant week! Thank you. I love them fresh and firm with seasoning and herbs! Thank you. I loved it too! I agree about the baked tomatoes. I don’t mind them cooked in with other things (like in an omelet) or in the form of a tomato sauce. But straight-up baked tomatoes are definitely not for me either! Thank God I’m not the only one. Hope times are great in Ottawa? Have a lovely weekend! This looks wonderful and so fresh, Liz! Our tomatoes are just now ripening in the garden so will have to use your recipe. I’m with you about baked tomatoes! I hope all is well with you, and that your time off of blogging is a help. Thanks so much Shari, I hope you’ll mail me some fresh tomatoes (ha! ha!). The time off was splendid but I sure glad to be back. I wish you a pleasant weekend! Hi Liz, We just finished dinner, and I had to sit down immediately and tell you how much we enjoyed your Tomato Salad with Fresh Herbs tonight. I used tomatoes from our garden, and when I tasted your dressing on top of them, they were over the top delicious! I loved all the fresh herbs in it. It was really fun to make as almost everything in the dressing came out of our garden as well, except for the vinegar and oil. I almost wanted to drink that dressing, it was so good. We all agreed it was like eating bruschetta without the bread. Thank you so much for sharing this. I know I will be making it again and again! You know, this is one of the best salads I’ve eaten this year. It’s really simple but so tasty. I actually eat it on it’s own as a light lunch and thoroughly enjoy, with a slice or two of toasted bread. I’m glad you loved it too! It’s good that you have a garden. so you can just pick, make and eat. Thanks so much for giving me a feedback. I am glad you’ll be making it again and again like me! I wish you a wonderful week! It is almost time for fresh from the garden tomatoes and herbs galore!!! Can’t wait. FYI – I have a garlic allergy and substitute shallots in recipes. Garlic can be so pervasive….a nice way to shake things up too! Be well. Thanks so much for stopping by. I really admire those who eat fresh tomatoes from the garden. I hope one day I shall join the party too! Have a wonderful weekend! One of my favorites, tomatoes and herbs. I hope to be eating this A LOT soon. My tomato plants continue to grow taller… I do like a good stuffed to stop too, cooked or raw. I imagine I’ll have lots of tomato posts soon enough! I look forward to tomato posts, Mama D. With 51 tomato plants, that’s gonna be a tomato fiesta. I know I’ll enjoy the posts coz I love tomatoes!!! They are mushy and yaky especially when they’re whole baked tomatoes. I don’t like them, at all!!! Wow Liz! Such flavors…perfect for summer! Beautiful! Thank you. 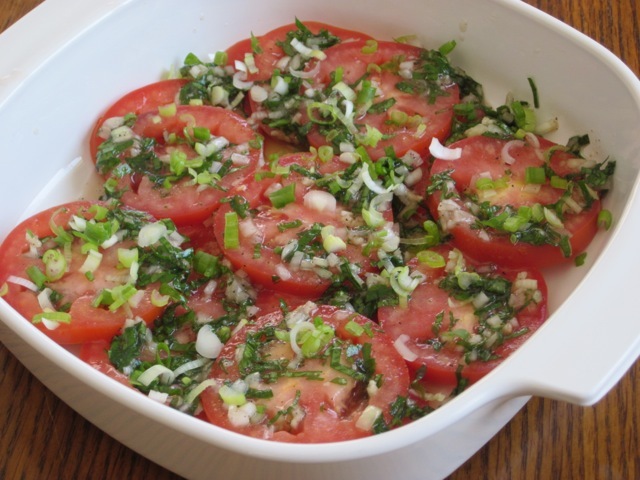 I love fresh tomatoes and herbs. Excellent flavour combination. Enjoy the weekend! Ha ha so you know I have tea or coffee, morning time! I’ve been away but now I’m back. I wish you a very pleasant weekend! This reminds me of in the summer when my parents start getting tomatoes off their plants and they would do something similar and put thin slices of fresh mozzarella on top- so tasty. And I am with you on the whole baked tomato issue, though I can’t say i’ve come across baked tomatoes like that all too often. Thanks for giving me a new dimension to my favourite tomato salad. I shall try the fresh mozzarella next time I make this. Baked tomatoes and me…miles apart. I hope all is well for you too! Have a lovely weekend!